History reveals China has neither the will nor the clout necessary to sway North Korea’s decision making. As the most important neighbor for North Korea, formally known as the Democratic People’s Republic of Korea (DPRK), China has been viewed by the international society as the vital player on the Korean Peninsula. With the recent sanctions, co-published by China’s Ministry of Commerce and China’s General Administration of Customs, it seems that China is resorting to a more coercive attitude toward North Korea. However, in contrast to the high expectation from international society — especially South Korea, the United States, and Japan — about China’s ability to influence Pyongyang most Chinese, especially international relations scholars and researchers, harbor mixed feelings about sanctions against the DPRK. These complex feelings about the DPRK represent China’s limited capability and will to influence its neighbor. China, as the biggest state in East Asia, has long viewed the Korean Peninsula as its “front yard” and an important “buffer zone” against rivals from the Pacific. For more than 2,000 years, China and Korea have enjoyed similar cultures, while politically, Korea was viewed as “little China” in the tributary system led by the Chinese empire (at least in Chinese histories; many Korea nationalists deny this). China lost its dominance over Korea only at the end of 19th century, when China was defeated by Japan in the Sino-Japanese War of 1894-1895. Although China did not dominate the Korean Peninsula after that point, succeeding governments still kept close relations with Korea. Many Korean nationalists who resisted the Japanese occupation located their headquarters in China’s northeast, Manchuria, and tried to obtain financial support from China. Some Korean nationalists were supported secretly by Chinese security and intelligence agencies to assassinate Japanese military and political leaders. For example, the Korean nationalist and hero Yoon Bong-gil, who assassinated a Japanese general in Shanghai in 1932, was funded and coordinated by China’s KMT government agencies. Kim Il-sung, the first leader of the DPRK, led the guerrilla war against Japanese occupiers in Korea and Manchuria in the 1930s. After World War II, the Korean Peninsula was separated and occupied by the United States and Soviet Union. However, during the Korean War, it was China that became the most important supporter for the DPRK. The People’s Republic of China, which is guided by communist ideology, believed it was vital to support the DPRK as a buffer zone between itself and “imperialism” led by the United States. China’s support, both material and moral, to North Korea lasted for decades, even when China-Soviet Union alliance cracked in the 1960s and 1970s. 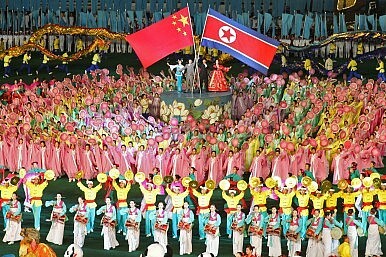 The DPRK was viewed by China as friend, ally, and comrade in international affairs. After the Soviet Union’s demise in the 1990s, China became North Korea’s only international supporter and its most important trading partner. In the early 1950s, when the Chinese People’s Volunteer Army led by General Peng Dehuai entered Korea to help DPRK defend itself from military offensives led by the United States, contradictions between Beijing and Pyongyang emerged. The DPRK leader, Kim Il-sung, claimed that Peng and Chinese forces in Kore, should follow his orders because they would fight in Korea. Peng, however, believed Kim should obey orders from China because the DPRK forces had been largely defeated and dispersed and Chinese forces in Korea had become the leading force. The Soviet Union’s Joseph Stalin mediated the confrontation and asked Kim to follow orders from China and Peng. After the Korean war, Kim sought to distance his country from China. He furthered the pace of “language reform,” which taught Koreans to write using the Korean alphabet rather than Chinese characters (before this, many Koreans were able to write and speak fluent Chinese, including Kim Il-sung himself). North Korea also has a long history of repressing groups that are seen as close to China, from eliminating the pro-China “Yan’an Group” in the 1950s to current leader Kim Jong-un’s 2013 execution of his uncle Jang Song-thaek, who was viewed as the senior politician closest to China. The DPRK’s efforts to lessen its dependence on China continue today. For example, both Kim Jong-un and his father, Kim Jong-il, steadfastly rejected advice from China about undertaking economic reforms, partly because Pyongyang feared the reforms would increase China’s economic and political influence. These long-standing efforts to decrease Chinese influence make it obvious why China is not able to determine Pyongyang’s foreign policy. At the same time, China is hesitant to take measures to press the DPRK to give up its nuclear program. This hesitation does not mean that China hopes to live with a nuclear-powered neighbor in North Korea. China’s stance is consistent — the Korean peninsula should be a “non-nuclear area.” Faced with North Korea’s continuous efforts to become a nuclear-weapon state, China adopted sanctions in the hopes of containing that nuclear ambition. However, China’s willingness to pressure the DPRK is limited. Many Chinese experts believe it would be dangerous to punish the DPRK too seriously. Some Chinese experts believe it is impossible to persuade Pyongyang to give up its nuclear program, and the DPRK may turn its hostility toward China if Beijing pushes too much. Other Chinese scholars believe North Korea should be kept as a buffer zone that separates China and the United States’ sphere on influence, meaning China must not endanger the DPRK’s domestic stability through sanctions. Perhaps the most fundamental reason for China’s hesitation or “weakness” in its Korea policy is the important meaning of the Korean War for both Chinese nationalism and the Chinese communist regime’s legitimacy. Most Chinese view the war as a victory and a source of national pride; they believe China, although at the cost of huge casualties, won the Korean War and resisted U.S. military offensives. If China totally abandoned the DPRK now, did hundreds of thousands of Chinese soldiers die in Korea in vain? That would be a vital blow to Chinese nationalism and the Chinese communists’ political legitimacy. In sum, China, on the one hand, lacks the capability to influence Pyongyang’s internal decision-making, given North Korea’s desire for self-dependence. On the other hand, Beijing hesitates to significantly pressure, much less abandon, the DPRK because of the country’s important symbolic role in China. These twin factors are why China consistently supports political dialogue, rather than pressure, to engage North Korea. Wang Jin is a Ph.D. candidate at the School of Political Science, University Haifa, Israel. The Swiss President offered to play a mediatory role on the Korean Peninsula.